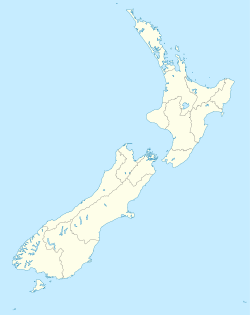 Tapanui is a small town in West Otago in New Zealand's South Island, close to the boundary with Southland region (population 744 as of 2006 census). A forestry town, it lies between the foot of the Blue Mountains and the Pomahaka River. Deer stalking and trout fishing are popular pastimes of the area. For almost a hundred years, the town was serviced by the Tapanui Branch railway line, which despite its name never actually terminated in Tapanui. This line was formally opened in late 1880 and closed after being damaged by severe flooding in the region in October 1978. State Highway 90, which links State Highway 1 at McNab, near Gore, to State Highway 8 at Raes Junction, passes through Tapanui. The town is home to Blue Mountain College, which takes students up to year 13. Nearby locations include Landslip Hill, a fossil-bearing geologic feature. In 2015, Tapanui was a filming location for the Disney production Pete's Dragon, with the main street and old timber mill serving as their equivalents in the fictional town of Millhaven. In New Zealand the name Tapanui is closely associated with the mysterious ailment chronic fatigue syndrome, which – until it became an accepted ailment – rejoiced in the nickname of "Tapanui 'flu". The doctor who first documented the rise of the condition in New Zealand, Dr Peter Snow, was based in the town. ^ "Production on Disney's Pete's Dragon Underway in New Zealand". broadwayworld.com. 10 February 2015. Retrieved 10 February 2015. ^ "Disney's Pete's Dragon Filming Locations". newzealand.com. Retrieved 16 August 2016. ^ Peter Snow (December 2002). "Reminiscences of the chronic fatigue syndrome" (PDF). Royal New Zealand College of General Practitioners. Archived from the original (PDF) on 7 October 2006. Retrieved 24 July 2006. ^ Royal New Zealand College of General Practitioners. "New Zealand loses a fine GP". www.scoop.co.nz. Retrieved 24 July 2006. ^ "RNZCGP Annual Report, with elegy on page 37" (PDF). Royal New Zealand College of General Practitioners. p. 37. Archived from the original (pdf) on 7 October 2006. Retrieved 24 July 2006. This Otago geography article is a stub. You can help Wikipedia by expanding it. This page was last edited on 5 February 2019, at 03:46 (UTC).